The Masters of Spinjitzu are stuck on a comet, having traveled through space to save the World of Ninjago from the Nindroids. 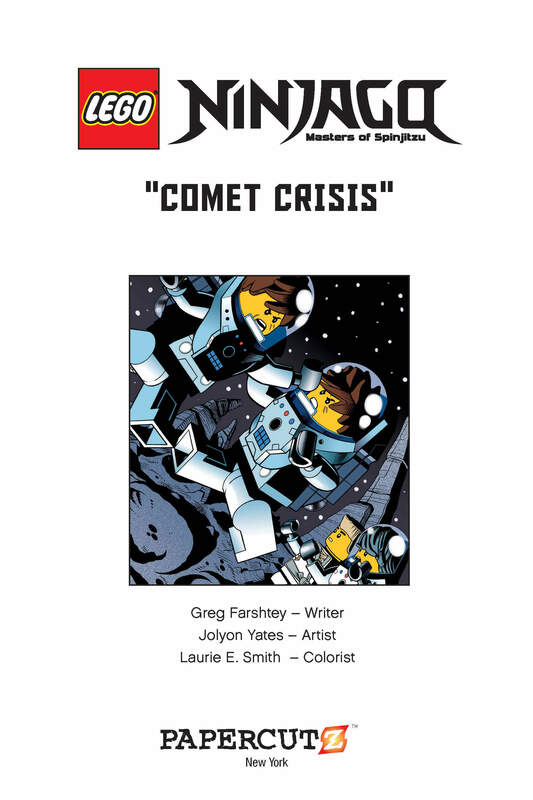 As they race through the stars, it becomes apparent that they are not alone on the comet. Something has stowed away… something not of their world. A factory in Ninjago Village is under siege by an unstoppable new menace, with the beloved mayor and his daughter held hostage! Only Nya, Jay, Cole, and Kai — the Masters of Spinjitzu — can save the day . . . or are they? Much to the brave warriors’ astonishment, a new gray ninja is on the scene! Is the Phantom Ninja friend or foe, and will his reckless fighting style sabotage the rescue mission before it even starts? Unlike his fellow Masters of Spinjitzu, Zane is not human. In fact, technically he’s very similar to the Nindroids—the ninjas’ newest enemies! So what will happen when Zane, feeling alone and apart from his teammates, is invited to join the Nindroids? Will Zane betray his friends? Also featuring an all-new Green Ninja story! After Jay, Cole, Zane, and Kai defeated Lord Garmadon once and for all, the skeletal baddie actually joined the good guys! Garmadon and his son Lloyd are reunited, and the new powerful team, led by Sensei Wu, is totally unstoppable . . . unless they have to face one of their own. Before Garmadon turned, he had placed terrible doomsday devices all over Ninjago, timed to activate in the event of his defeat. Now he must lead the ninjas in a quest around the world to battle these maniacal menaces, and hope that their first mission together isn’t their last! The blockbuster graphic novel best-seller continues in this thrilling tale of endings and new beginnings! The best-selling mega-hit continues as Jay, Cole, Zane, and Kai square off against the evil Stone Warriors! Frustrated and discouraged by their lack of powers and their inability to defeat the Stone Warriors, Jay, Cole, Zane, and Kai learn secrets of Sensei Wu’s past adventures that may hold the key to future victory.